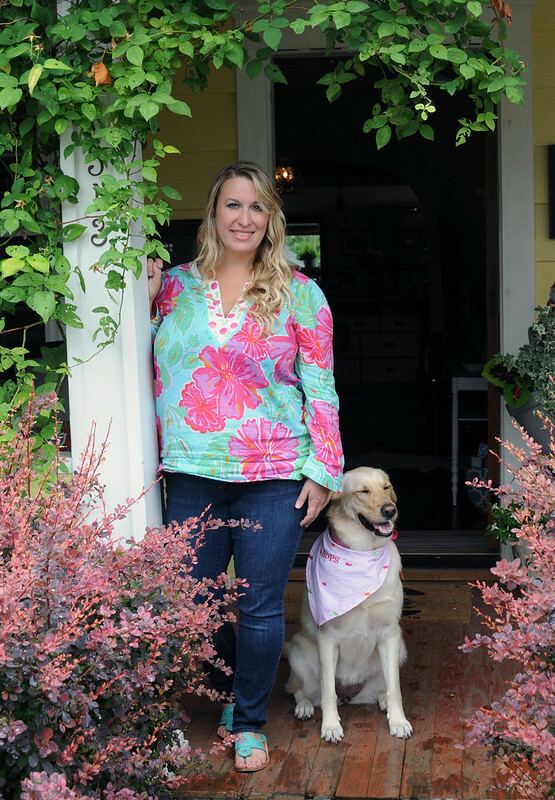 In her charming Del Ray cottage, with a front porch surrounded by gorgeous flowering vines and ornamental perennials, Phara turns curbside castaways into beautiful works of art. 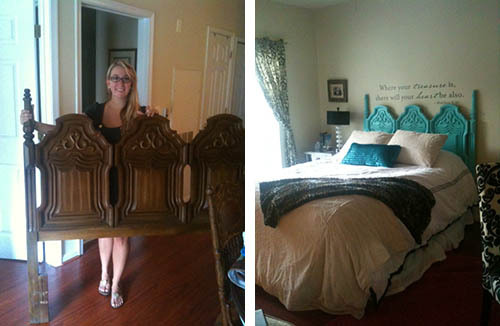 She’s a talented DIYer with a keen eye for furniture rescue and rehab, a skill she learned from her grandmother. I visited Phara to check out her collection. Most of her pieces were either found on the street or purchased at yard sales and thrift stores. Classic older furniture is usually built well, so while the finish may be damaged, the pieces themselves are structurally sound with many more years of use ahead of them. 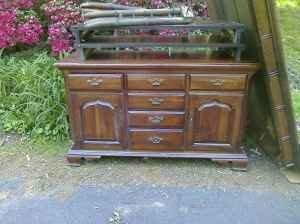 For example, take a look at this dresser Phara found on the street. 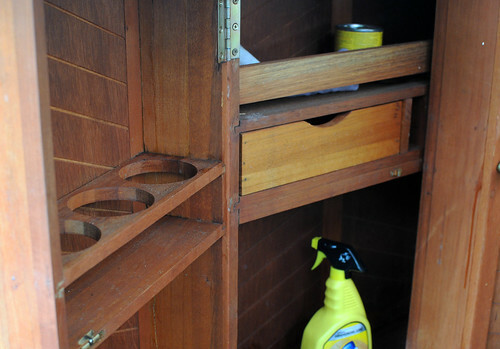 She cleaned out all of the cob webs and sanded and re-stained the top in a dark walnut finish. 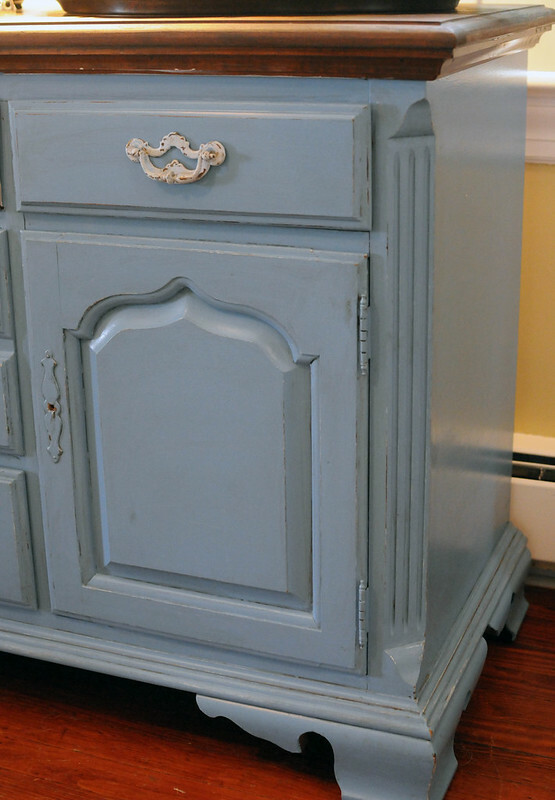 For a one-of-a-kind fresh look, she painted the bottom portion in a vintage blue chalk paint and sanded the edges. 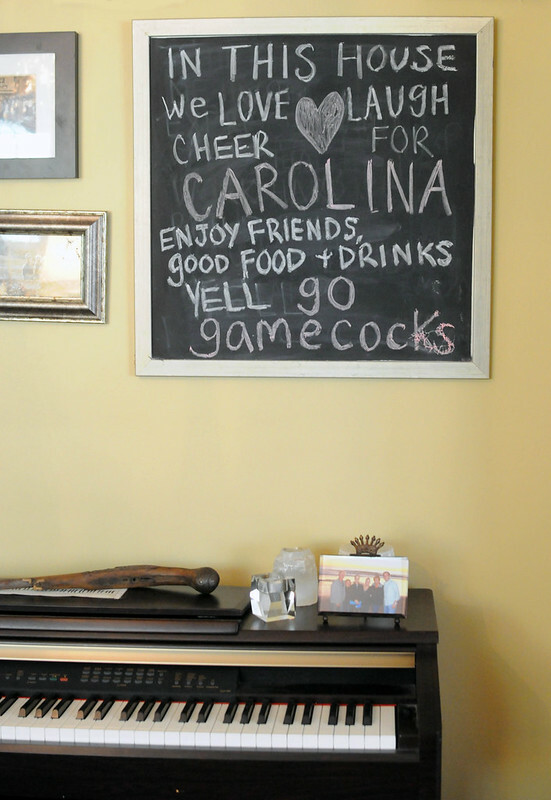 Now she uses it as a sideboard and bar in her dining room. 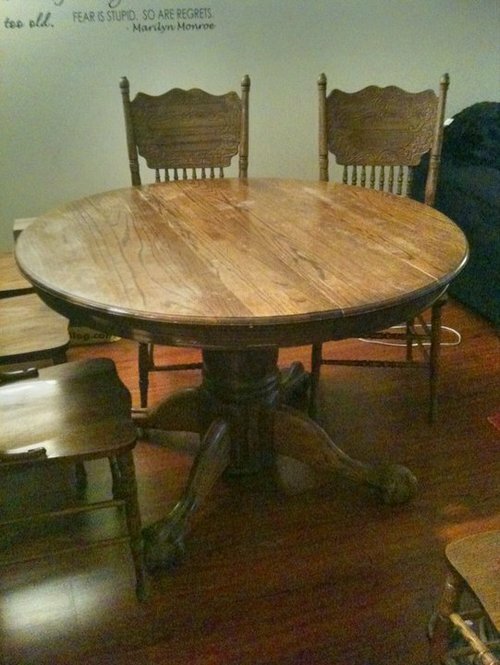 This dining table was free from some friends. 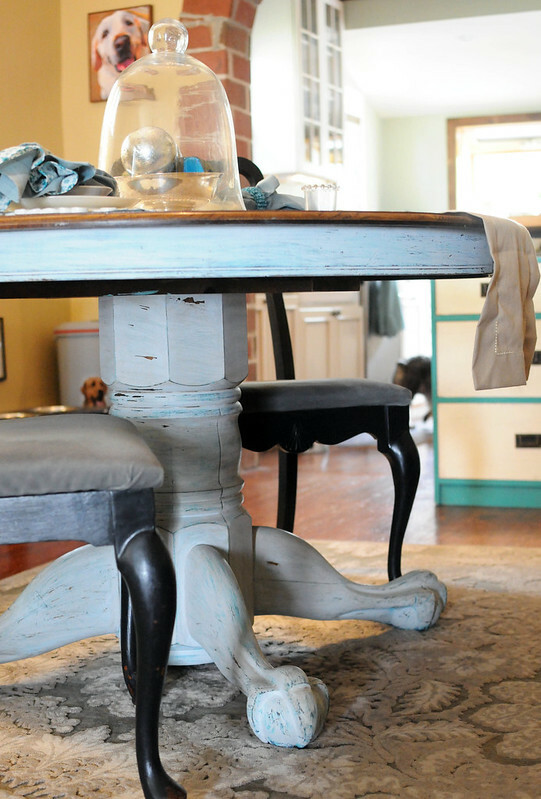 Again, she sanded and re-stained the top in a dark walnut finish and distressed the base with multiple colors. You can see hints of the Tiffany blue peeking out from under the top layer of grey. With enough furniture to fit her own home, she’s continuing to rehab old furniture but selling the pieces as a sideline business, which she calls Very Phara. 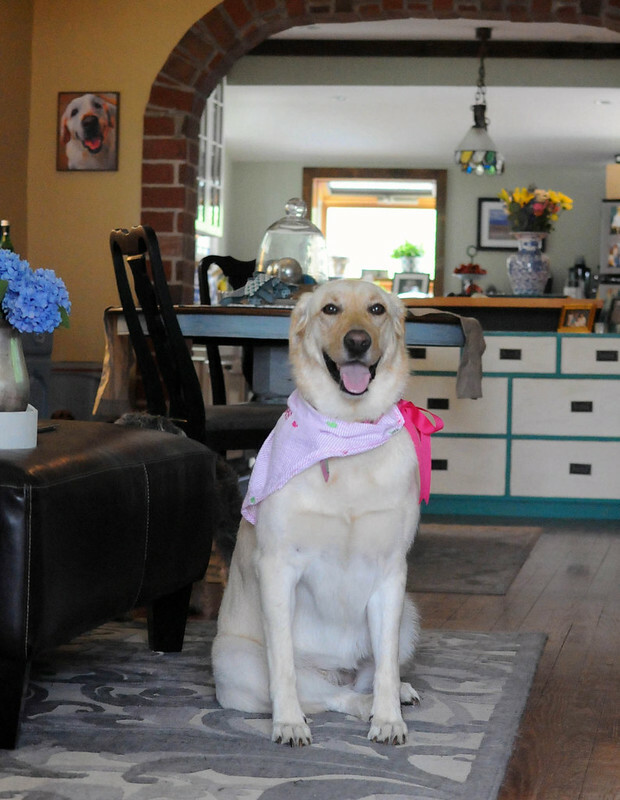 Behind her very photogenic dog Hops you’ll see a campaign dresser that’s up for sale. Here’s a closer look. 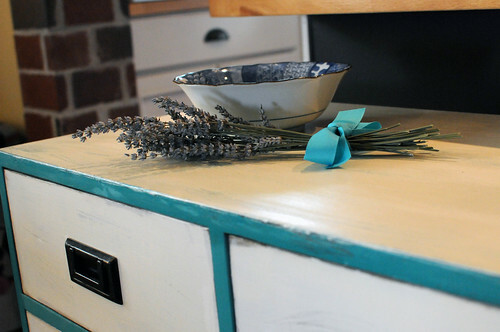 Phara painted the drawers and sides white and added turquoise accent trim. Out back, this bar’s makeover is still in progress. She found the bar at a yard sale in Old Town. It has a lot of storage potential inside. I can’t wait to see what she does with it. 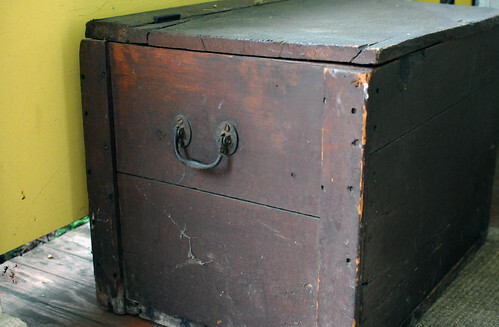 She’s also still working on this chest, its fate is TBD, but with a lid that opens up, it’s an ideal small-space storage solution. 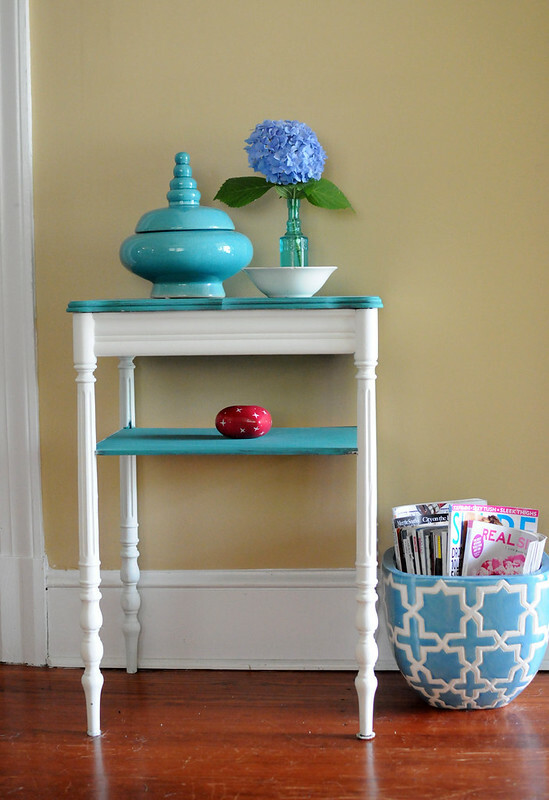 One of my favorite pieces is this side table by the front door. 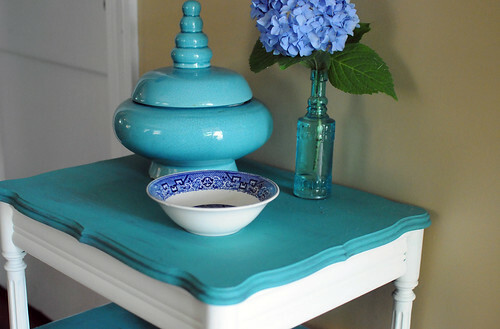 The cool turquoise is a theme throughout her home. 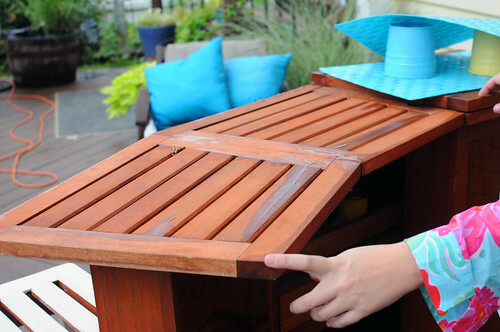 Besides painting furniture, she’s a big proponent of upcycling. She converted a door she bought at Community Forklift for $1 into a headboard and also saved a headboard from Goodwill’s throwaway section (because it didn’t have the right hardware) and painted it a bright turquoise. 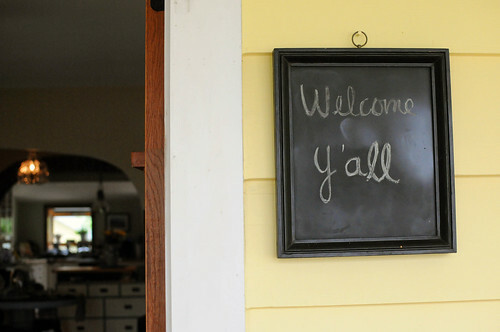 You’ll also see picture frames outfitted with chalkboard paint in her house — first as a welcome sign on the porch and second as a message board above the piano. 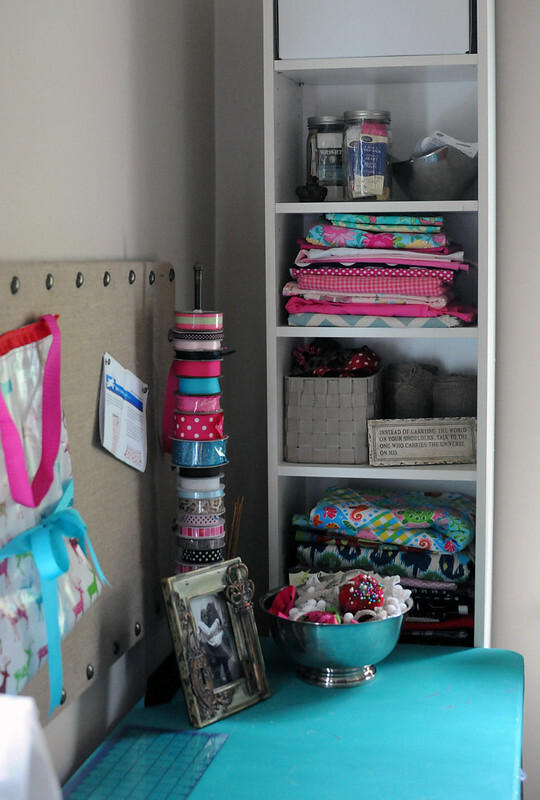 And to add to her talents, Phara makes use of a small nook in the back of the house as a sewing and craft corner. 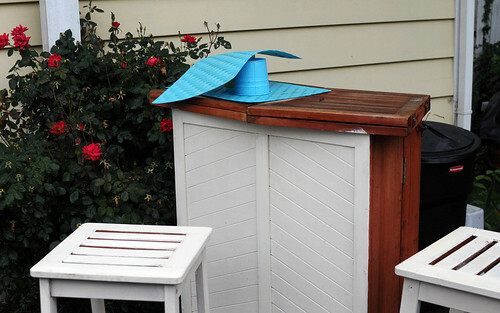 The plastic table is from Costco — she painted it and added a skirt to cover storage bins underneath. 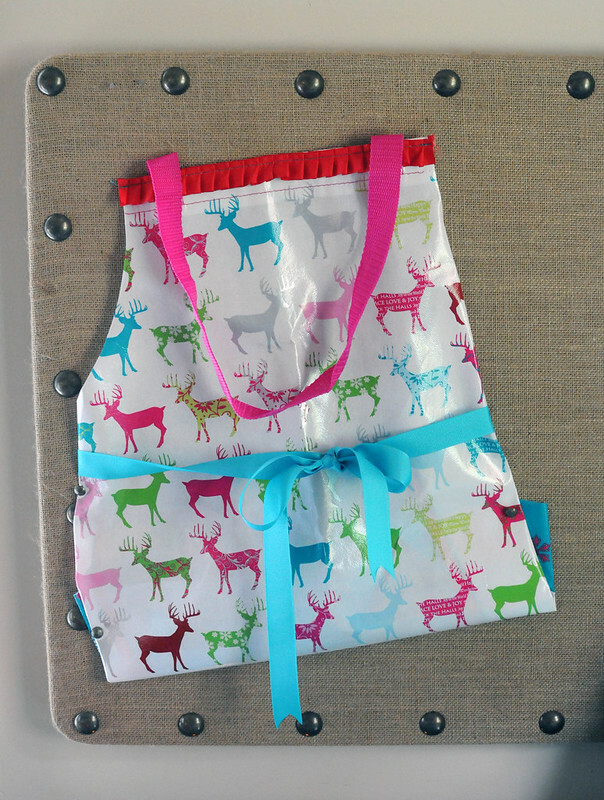 Here’s one of her many craft projects — a darling child’s apron she upcycled from a shopping bag. 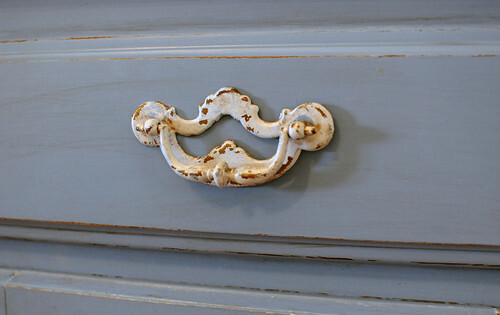 On most of her furniture pieces, Phara uses the popular chalk paint which you can buy online and at antique stores. She also uses regular latex house paint. So the next time you see a beat-down dresser on the curb or a cobweb riddled side table or something you’re not sure what it is, take it from Phara, there’s probably some life in that old piece yet. For more about Phara, visit her website Very Phara. What a great post on Phara’s furniture! As her neighbor, I can say that her pieces are even more beautiful in person – she really has a gift for bringing old furniture back to life.